← You Want to Inject What in the Trees? I know it’s already October, but Summer is still lingering here in San Diego where the warm desert breezes, called the Santa Anna winds, brought the temperatures back up to the high 70s. Or perhaps, I am clinging to the longer, warmer days that bring yummy fresh fruits and veggies from the garden and the smell of beach and sunscreen on my kids’ hair and skin. In any case, the following recipe is definitely a perfect summer soup for those warm days when you feel like having something cool and refreshing. Combine cucumbers, garlic, red onion, extra virgin olive oil, lemon juice, dill, and coriander in a large bowl. Salt and pepper to taste. Chill the cucumber mixture for at least one hour. When ready to serve, pour the cucumber mixture in a blender. Add the avocado and crème fraiche. Blend until it is a smooth puree. 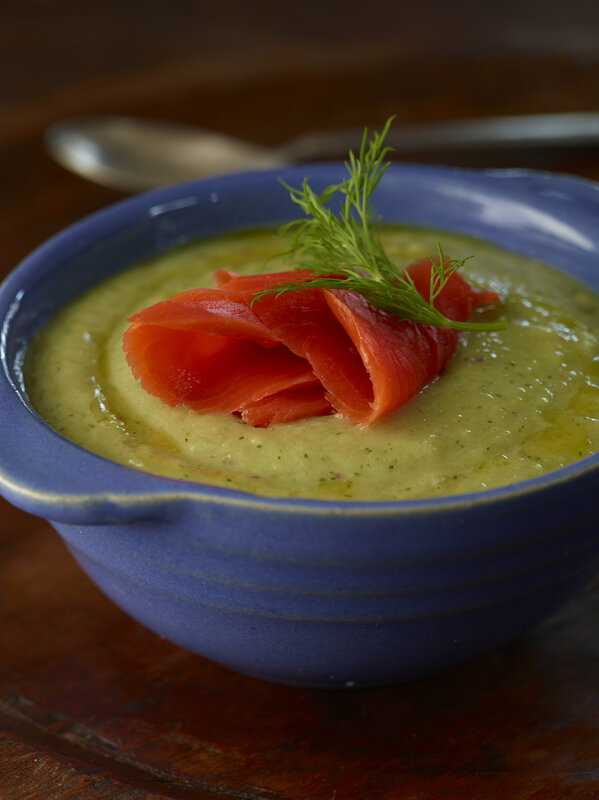 Divide the soup into four bowls, topping each with ¼ cup smoked salmon and drizzling with olive oil. Recipe and food styling by Theresa Gilliam. Photography by Angie Norwood Browne. More of Angie’s work can be viewed here. This entry was posted in Recipes and tagged avocado, avocado soup, chilled soup, cucumber, dill, recipe, smoked salmon, summer soup. Bookmark the permalink.